At the National Remembrance Day for the Christchurch shooting last Friday, Farid Ahmed, whose wife died in the attack, said, “I don’t want to have a heart that is boiling like a volcano. A volcano has anger, fury, rage; it doesn’t have peace, it has hatred. I don’t want to have a heart like this and I believe no one does. He received a standing ovation for sharing his deeply courageous response to the shocking tragedy. 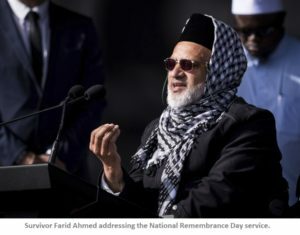 Since that fateful day on March 15, when 50 people were so needlessly killed by a lone gunman, New Zealanders have rallied around the families of the victims to share their love and support. Our Prime Minister has received national and international praise for her handling of the tragedy and for reaching out to reassure the Muslim community that they are an important part of New Zealand. But the leadership of a nation operates on many levels. While the PM has been focussed on the suffering of the victims, in her desire to reassure New Zealanders that they are safe – and to look strong and decisive on the world stage – she has unleashed measures that have the capacity to turn our wonderful country into a totalitarian state. Her actions are in sharp contrast to the response of the Norwegian Government following the murder of 77 mainly young people by Anders Breivik in 2011. They decided they would not allow the attack to harm their democracy. They said that the proper answer to the violence was more democracy and more openness. Firstly, under the Prime Minister’s watch, heavy-handed State censorship has banned Brenton Tarrant’s video of the shooting and his ‘manifesto’, with draconian penalties of up to 14 years in prison or a $10,000 fine. While the censorship of the killer’s video is something that most New Zealanders can understand, the ban of the ‘manifesto’ is a different matter. It sheds light on why the atrocity occurred and could help people to better understand how something similar could be prevented from happening in the future. The fact that the manifesto was banned almost a week after the video also raises concerns about whether there was real or implied political pressure. Perhaps the Government did not want the public to realise that their knee-jerk responses to the shooting are exactly what the killer wanted. In attempting to beat Australia in the speed with which firearm restrictions are being introduced, the PM is using dictatorial powers to pass the Arms (Prohibited Firearms, Magazines and Parts) Amendment Bill. The Bill is now being considered by the Finance and Expenditure Select Committee through a public submission process that is a farce – two days instead of the normal four to six months. The Bill, which is expected to come into force on April 12, bans military-style semi-automatic firearms and assault rifles, as well as shotguns with magazines that hold more than five rounds. Many component parts will also be outlawed including magazines holding more than 5 cartridges for a shotgun, or more than 10 cartridges for other guns, along with bump stocks, pistol grips, sights, and silencers. Ammunition to be prohibited will be defined at a later stage by the Governor General through an Order in Council and will include armour-piercing bullets. Exemptions to the new law include semi-automatic .22 rifles with magazines holding 10 rounds or less, and pump action shotguns with magazines holding five rounds or less. Exemptions also exist for gun dealers, collectors, museum curators, film makers, pest controllers, and for Police and Defence Force personnel. Penalties for breaking the new law include up to 10 years in jail. A buy-back scheme, which is estimated will cost the Government up to $200 million, is still being worked out. An amnesty is in place until the end of September, so that people who own guns or gun parts that will be illegal can surrender them to the Police without fear of prosecution. The way this rushed legislation has been drafted, a majority of law abiding gun owners will be criminalised through the ownership of commonly used parts, such as sights and silencers, that will be outlawed. This demonstrates only too clearly, why complex law-changes should never be rushed through Parliament – the potential for unintended consequences is just too high. Anyone concerned about the law change, who wants to put in a submission must do so by 6pm today (Thursday) by visiting Parliament’s website HERE – the Select Committee can be contacted on fe@parliament.govt.nz. The Government has also stated that it intends to introduce a second round of changes to gun laws later this year, which may include the registering of firearms, as well as changes to the vetting process, police inspections, and gun storage. Meanwhile, gang leaders are saying that they will not give up their illegal weapons even if the law compels them to do so. Even though the dreadful crimes in Christchurch were committed by an Australian visitor acting alone, it is New Zealanders who are now paying the price. Not content with restricting our freedom and democratic rights, through censorship and rushed law changes, the Prime Minister also appears intent on limiting free speech. Under the shadow of the Christchurch tragedy, radical opportunists are calling for hate speech laws to silence anyone speaking out against their agenda. In particular, Maori sovereignty activists are now labelling those who disagree with them as not only racists, but white supremacists and purveyors of hate speech as well. They are targeting New Zealanders of European origin, blaming them for the colonisation of the country by Britain almost 180 years ago. White New Zealanders are now being called oppressors, vilified for the fact that Maori are not the ruling class. It is all quite extraordinary. “If you’re serious about opposing racism, I have a challenge for you. Stand with Māori against the racism they’ve endured in New Zealand for centuries. “Since the arrival of Captain James Cook 250 years ago, Māori have struggled to gain a nationwide acceptance of their cultural values, language and spiritual beliefs. Colonisation is one of Cook’s legacies and racism against Māori is a part of it. New Zealand has inherited a British supremacy perspective and it pervades every area of our society. Their new tactic, based on the deception that the Treaty instituted a partnership between Maori and the Crown, seeks equality – not with other New Zealanders – but with the Government. They want to elevate Maori authority, customs and practices into a dominant position within society, with any disparity blamed on racism and white supremacy. Instead of telling the truth – that the Treaty of Waitangi established the Queen as our sovereign, protected private property rights, and gave Maori the same rights and privileges of British citizenship as every other New Zealander – activists are perpetuating the partnership deception to blame this generation for events that happened in a different era with different norms, attitudes and values. “By this I mean people like the Green MPs Golruz Ghahraman and Marama Davidson. In Parliament, Ghahraman blamed unnamed fellow MPs and breakfast radio ‘shock jocks’ for the ‘hate speech’ that she claims led to the killings. “Ghahraman was in such a rush to apportion blame that she wasn’t prepared to wait before making a considered response based on facts and evidence rather than supposition, assumption and prejudice. And why should she, when it was so much easier to make sweeping, unsubstantiated and emotive assertions about the killings being caused by ‘hate speech’, ‘white supremacy’ and ‘gratuitous racism’? “This was not about honouring or mourning the dead. It was about finding someone to blame and settling old ideological scores. Calls for restrictions on free speech by radical Government MPs should raise the alarm about our future. While the Bill of Rights protects our freedom of thought, expression, and association, as we have already seen through the Censor’s bans, these rights are fragile and can easily be taken away. New Zealanders who value the freedom and liberty that underpins our society should strongly oppose new laws to ban ‘hate’. Such laws, that would enable the Police to act against anyone expressing ideas contrary to those deemed acceptable by the Government, have proven to be a disaster in countries where they have been introduced, over-criminalising the population and allowing vexatious complainants to destroy lives. Furthermore, there are major concerns that preventing those with unacceptable views from airing them openly, drives them ‘underground’, where they are likely to become even more extreme. For the sake of our future, we must not let the radicals succeed in forcing through law changes to criminalise opposing voices, otherwise under Jacinda Ardern, New Zealand really will become a totalitarian State. Do you believe New Zealand needs stronger laws to outlaw ‘hate’? I have to tolerate the HATE speech from the likes of Gharaman & Davidson, who obviously have NO knowledge of NZ history. I have to listen to the rantings of a communist loving P.M. who will achieve her ideological goal of silencing all, apart from the radical Left if more legislation restricting free speech is allowed to be introduced. How long before the NZCPR platform is taken from us? Time is RAPIDLY running out for democracy as we once new it. In fact I think it is all but dead…. A.G.R.